This undercuts US and Saudi claims that they are making improvements in targeting to reduce civilian death tolls, and if anything the US seems to have only claimed that to bypass Congressional demands to halt aid. We hear cries of “racism” a lot in Western countries. Mostly that is politically motivated. Thousands are being murdered with the support of Western countries. The MSM is silent. Those that claim to be against racism are silent. There is nothing more racist than being silent while humans are being killed and lives are destroyed. Apparently it’s OK because they are just a bunch of brown skinned people over there. Brown on brown if that’s how you characterize them. 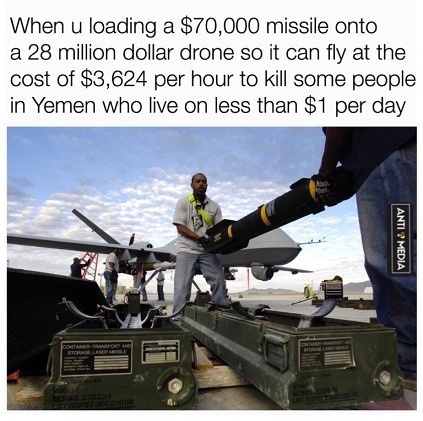 the US supplying the Saudis. As usual you missed the point. As usual, you avoid the point. in the ME, for the foreseeable future. It’s not a proxy war when you are committing a war of aggression by directly bombing civilians and have boots on the ground. German Law 101.
conducting war in Yemen, Gaza, Syria, Lebanon, Iraq etc. Why does the MSM continue to ignore this? Might it have to do with who actually controls the MSM? Can’t go into specifics about who THEY might be, as my comment will be blocked. Certainly, the laughter at Trump’s UN appearance said it all. 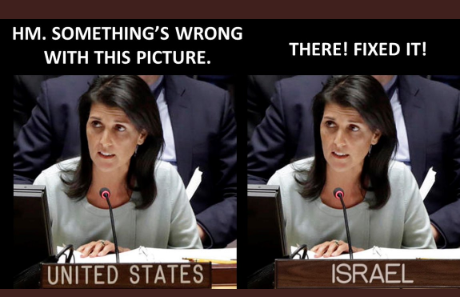 The only ambassadors not laughing were Israel’s and stupid Nikki Haley.